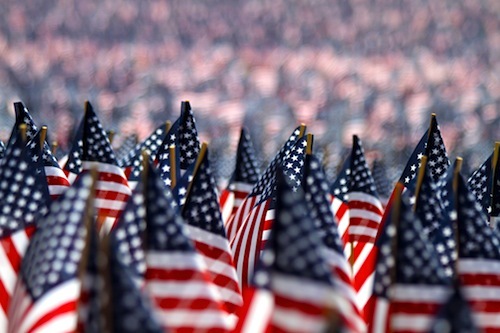 We celebrate this three day weekend in honor of those who gave the ultimate gift, their lives in the cause of righteousness, liberty and freedom. I and a grateful nation thank you for your gift. Three lovely days to give thanks, to share with family and friends, to indulge in life's joys. 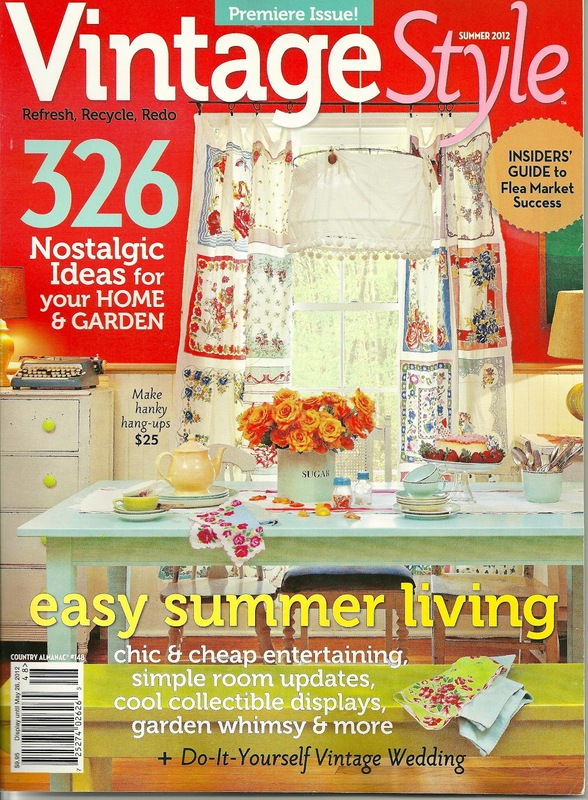 Did a little junkin, fluffed up my booths and found a new magazine. Have you seen this magazine yet? 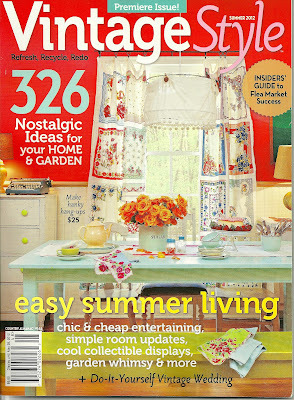 Vintage Style - premier issue for Summer 2012. Some great ideas, with repurposing of 40s-50s items as decorative uses for your home. I enjoyed the magazine a lot but it's a bit pricey off the newsstand at $9.95. Still, you can find it at Hobby Lobby and Joann's Fabrics and if you bring in their coupons you can purchase at half the price. FYI - if you have a smart phone, you can download their apps (free) and you always have that coupon on you. I love this feature as I never have to cut a coupon or forget it at home. It's always on my iphone and ready to use. 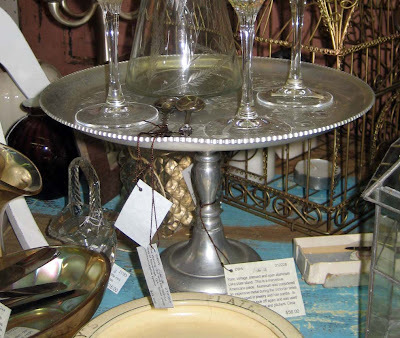 Headed over to Vintage Village in Snellville first as they always do holidays up so pretty. 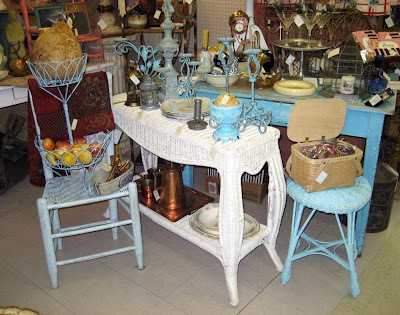 Lots of new dealers have arrived and I was fortunate to see antique friends as well. I was so excited about my road trip to "the Village" that I had forgotten my camera so I apologize for my cheesy little photos taken with my 3G iphone which doesn't have the best camera. 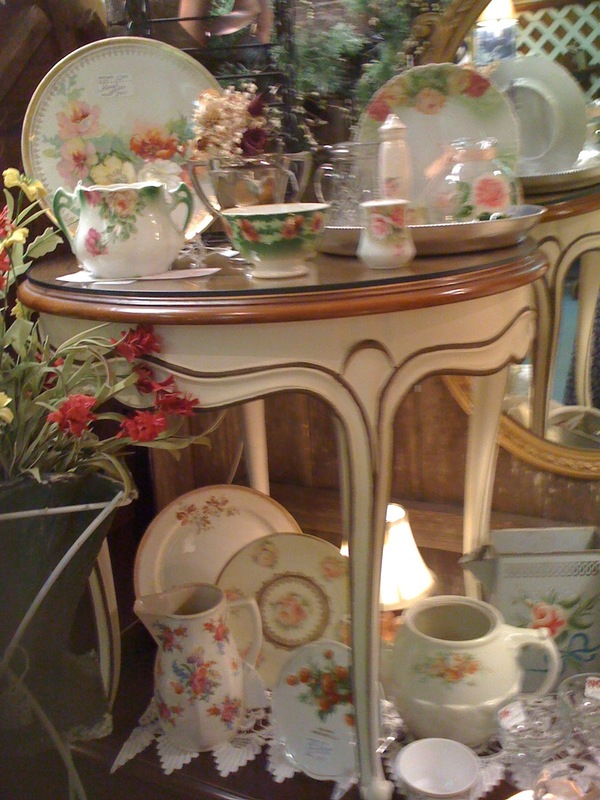 Pretty little table with lots of lovely vintage china. 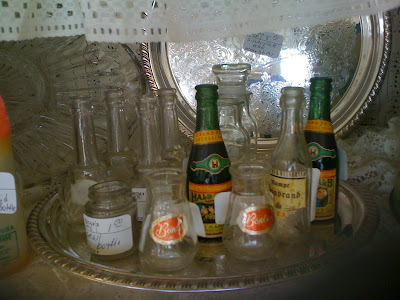 A tray full of mini vintage bottles. Love the old German mini-splits of champagne used to ring in the New Year. I adore American Primitive and I find so many marvelous things in this pretty booth. Nice soft past platters and yellow ware pieces abound. 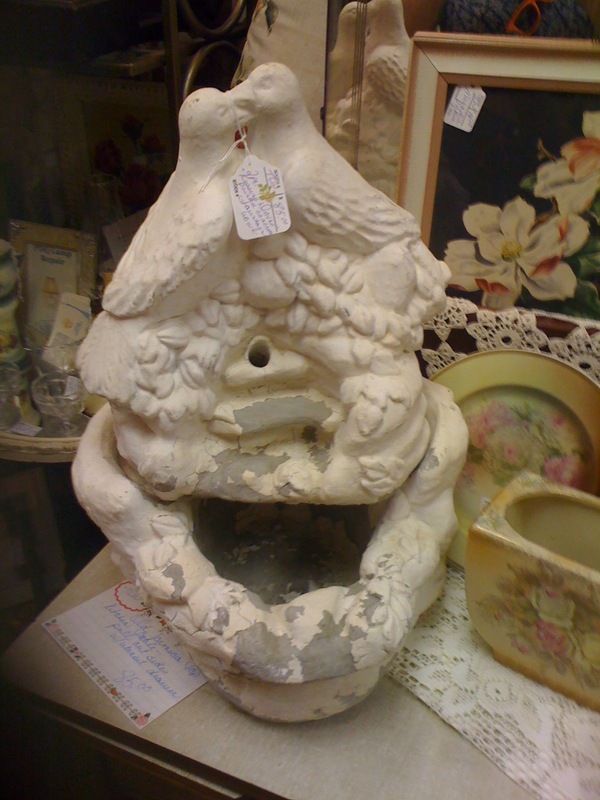 A pretty fountain with love birds can be filled with pretty antique Christmas mercury glass, your favorite plants or lighted candles. 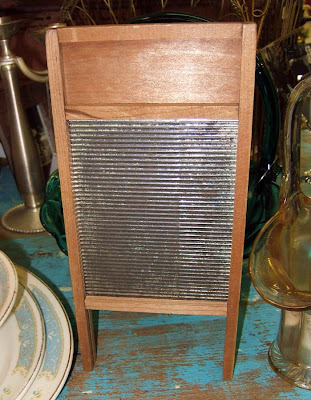 Darling tabletop dryer for herbs. I love dryers and had to work hard not to bring this home. 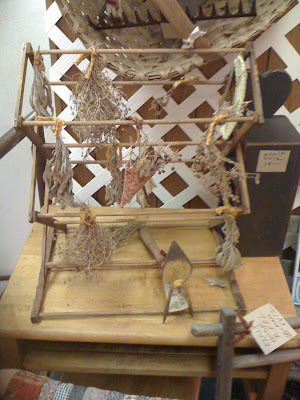 Sweet little primitive sewing table. 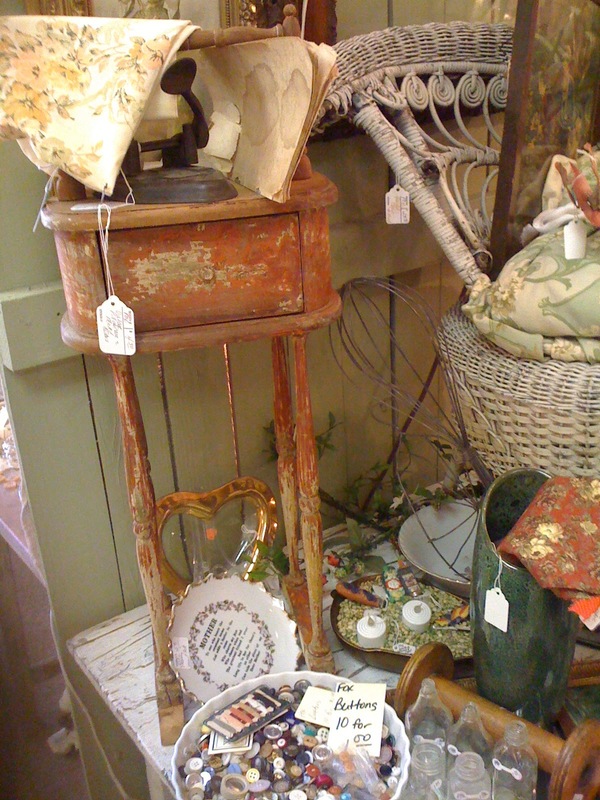 Lots of peeling paints from generations but the pretty 1930s orange still shows through. Paul and Jeanine always have lovely pieces. Their booth is like walking into a home. 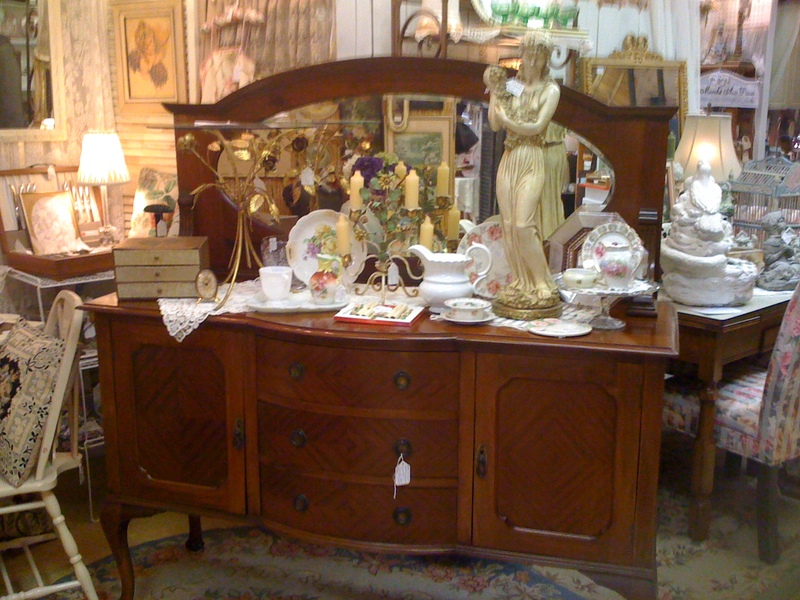 This is a new piece and I am crazy about the large, architectural mirror on this buffet. 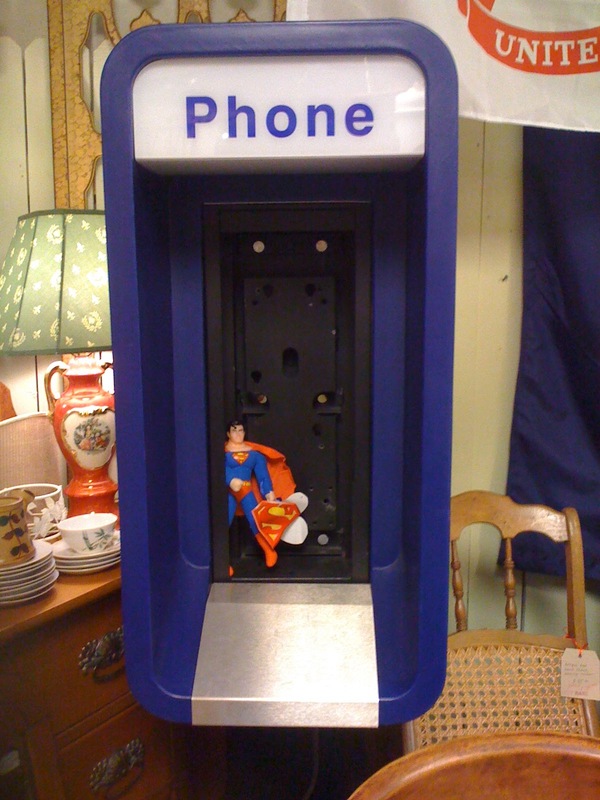 This outside phone booth made my laugh out loud when I saw Superman peeking out from it. Before Thomas Kincaid there were paint by number kits of cottages and this is a very, very well done paint by number from the 1960s. Brilliant colors are still true after all these years on this very, very large piece. 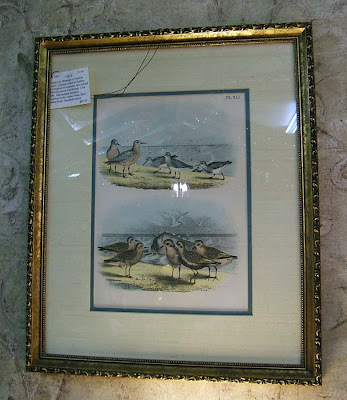 This painting is the very thing that Vintage Magazine would display. You can never miss with white...always a shabby, beachy, cottage staple. Another favorite dealer of mine at Vintage Village, I always walk away with an armful of treasure. 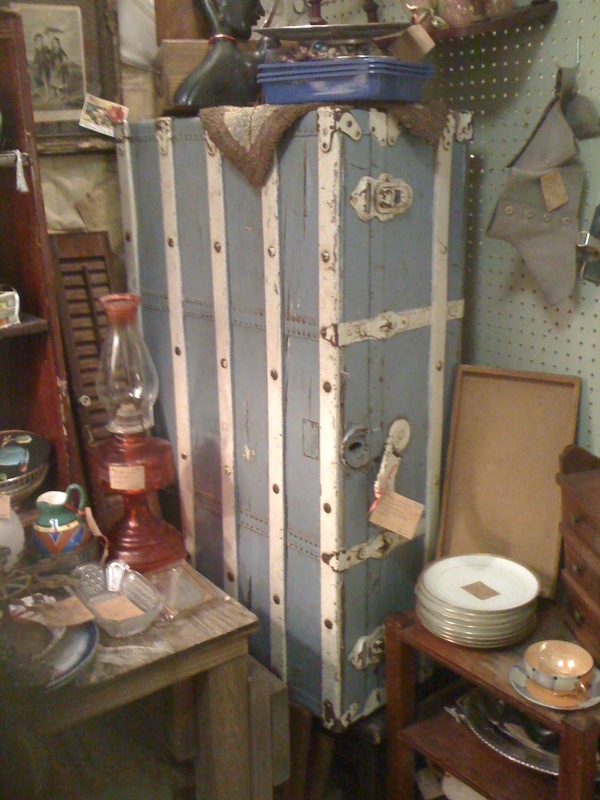 I keep jonesing about this marvelous blue and white trunk which would be perfect as a coffee table as it or if you want to put a glass table on it and add decorative iron tub legs. 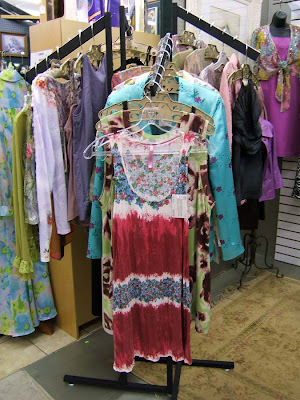 I don't need this but I just love the colors. 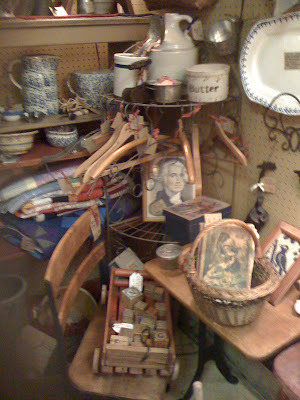 It was a delightful day and I found some treasure to keep and to resell and got to meet up with Vintage Village friends. 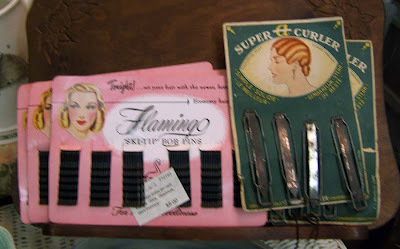 Both of these items I found at Vintage Village. I move glass terrariums as quickly as I can find them. 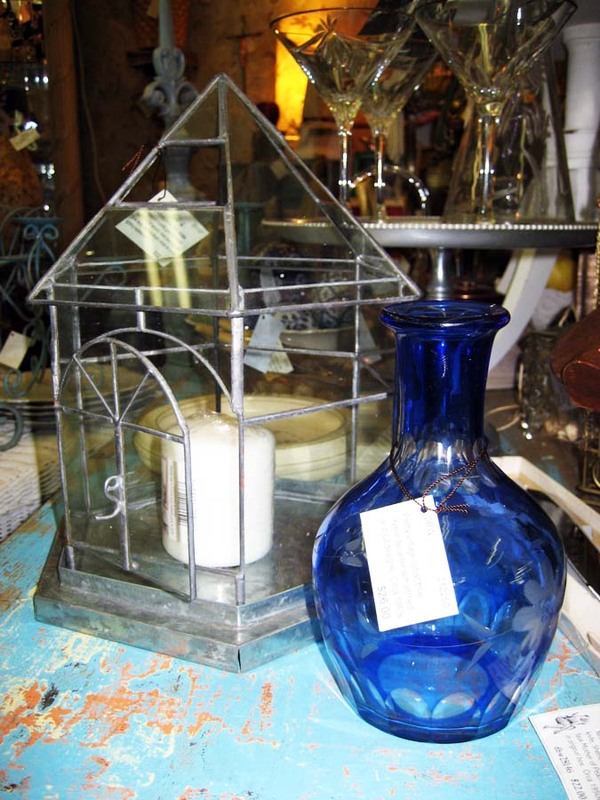 Love the brilliant cobalt blue of this cut and etched decanter bottle. Perfect for filling with brilliant red poppies or blue/purple hydrangeas. 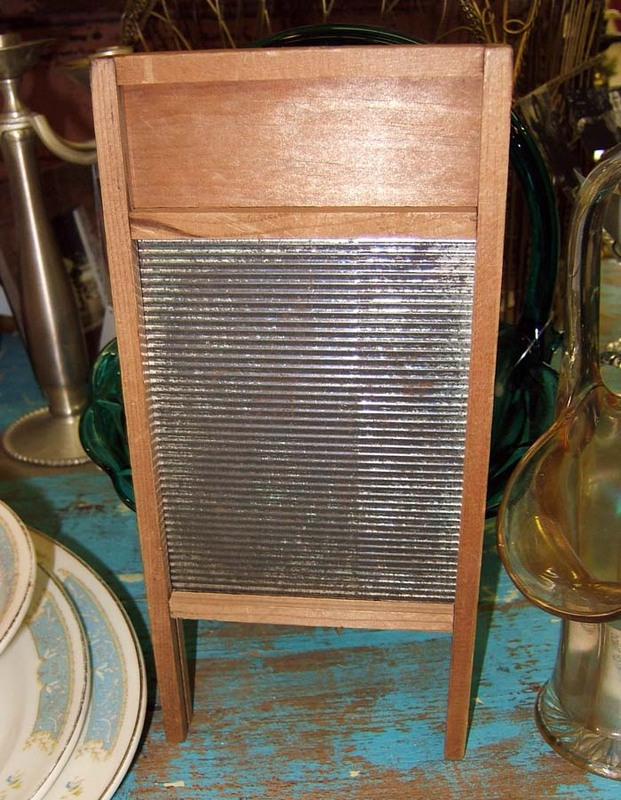 Do you know what this is? 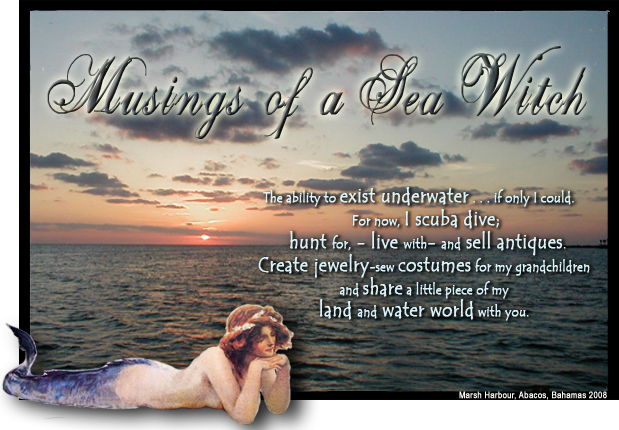 I love quirky items and this is a part from a WW2 American submarine periscope. It calibrates the optics/mirrors on the periscope. If you look into it you can see 90 degrees above you or to your left/right side as you flip the piece. Rare, spun and pressed aluminum footed cake plate. 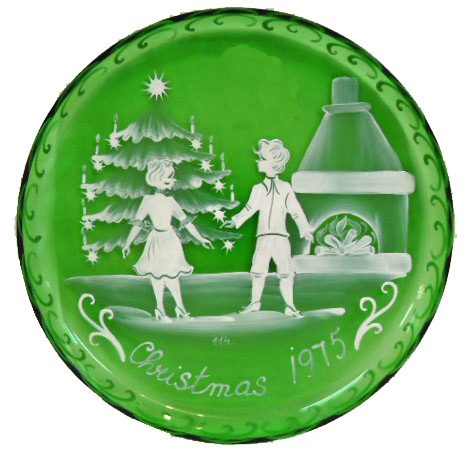 Nice piece from the 1940-50s. 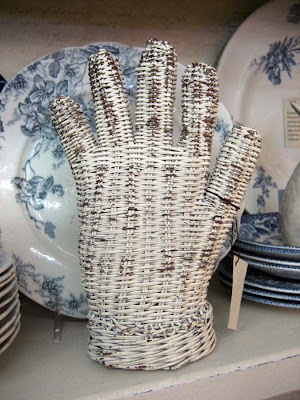 How cool is this vintage wicker hand? 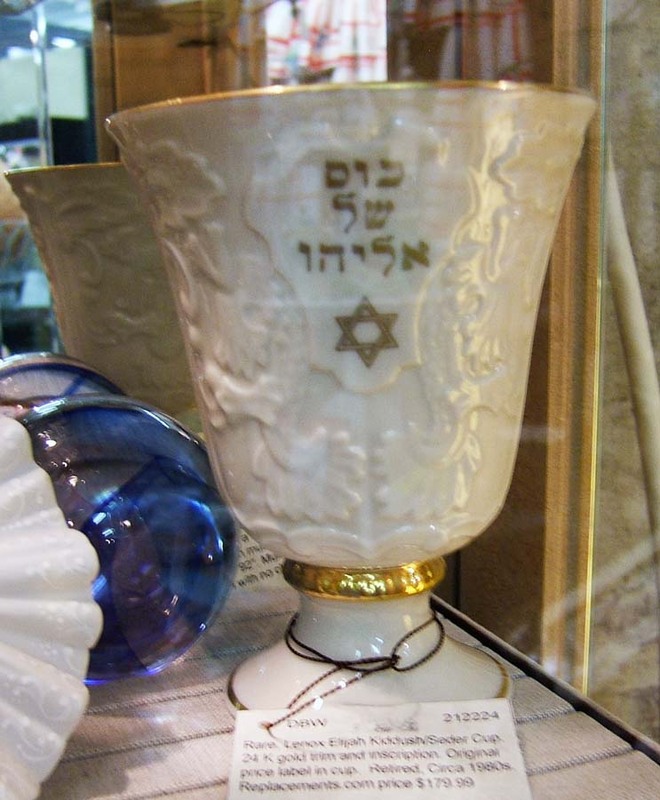 Such a unique item. 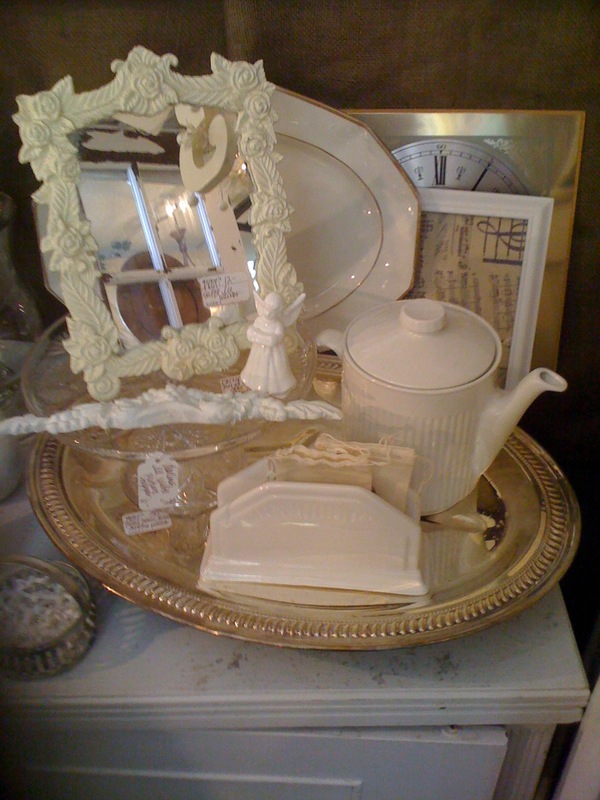 This bone china handled server is light as a feather. 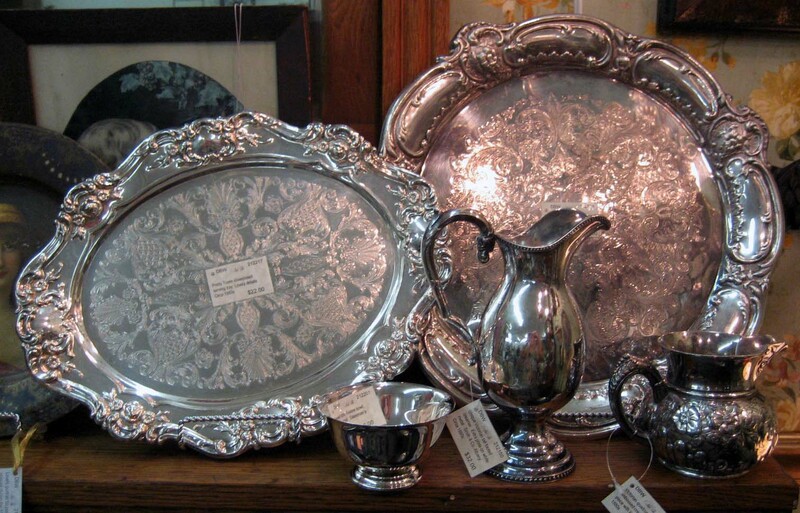 A pair of fantastic silverplate trays. Brilliant and in excellent condition. I sold the beachy blue Victorian table so I moved the white piece near it and loaded it with beachy blue candlesticks. 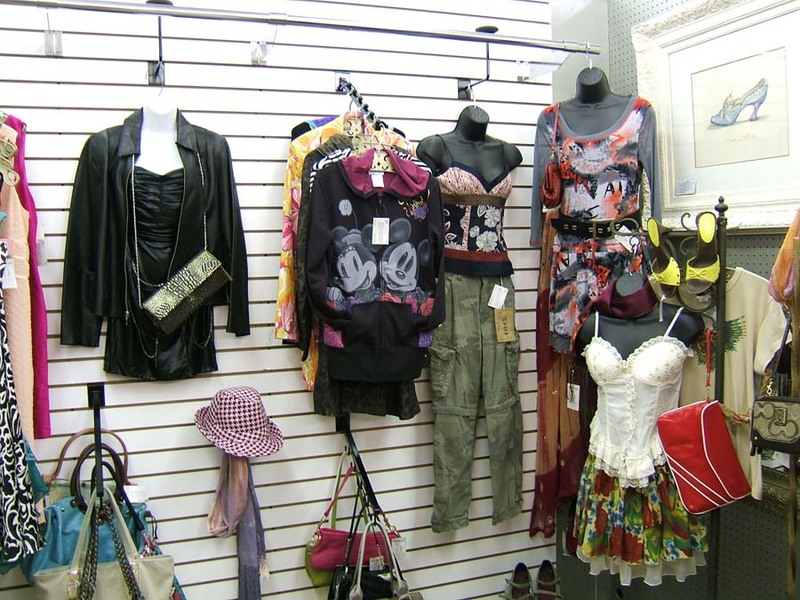 Found some great independent label and designer labels as well so I changed out the flat mannequins again. 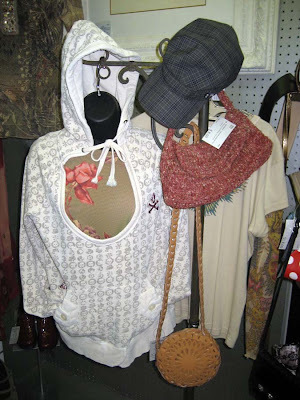 Funky and oh so soft cotton hoodie is perfect for nights on the lake or the beach and Ben Sherman pin strip cap from across the pond. Banana Republic linen shorts looks great with a J. Jill stripped nautical hoodie. 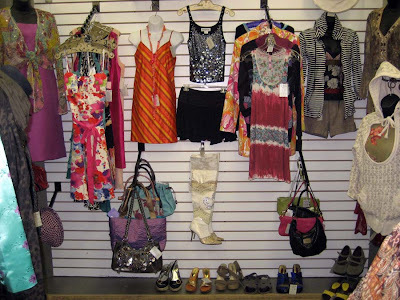 Laundry by Shelli Segal silk dress in orange and yellow stripes was a weekend find and so where those cool, over the knee boots. Close up of those boots by Wild Pair. Wanted to show off my work station at home. I usually work off of my lap and a pillow at home but have the opportunity to occasionally work remotely. Had to set up a small work station but didn't want to have it look like an office. 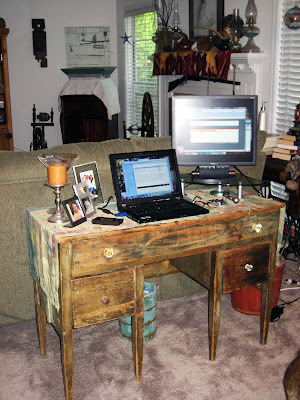 So I am using the primitive desk that you see. It is a Square Mile Desk from a Navajo reservation school, circa 1930s. 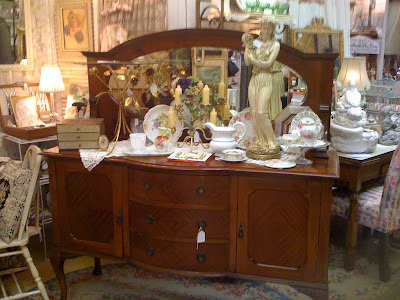 One of my favorite pieces with pretty, Hepplewhite shaped legs, pressed oval in front draw and crosses on both sides. It is perfect for my work laptop and a small flat screen monitor. 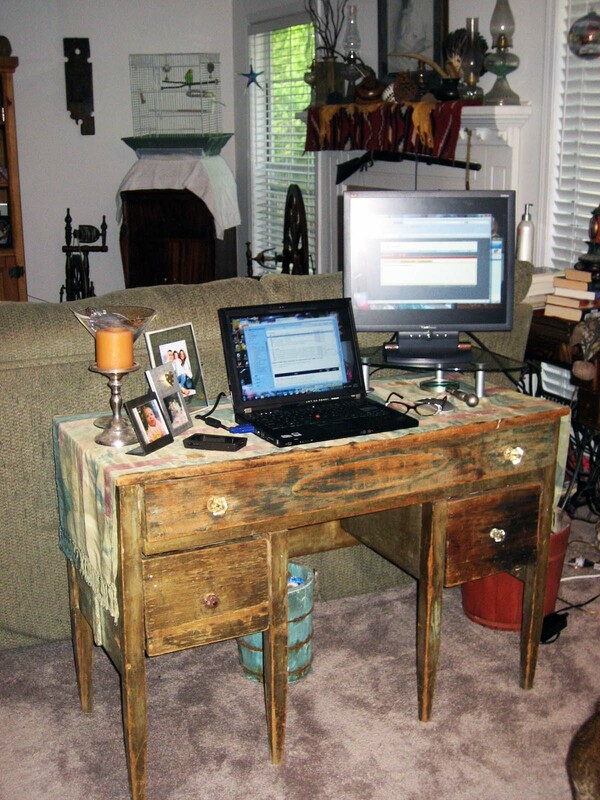 I love the clash of time periods with today's technology sitting on an antique desk. 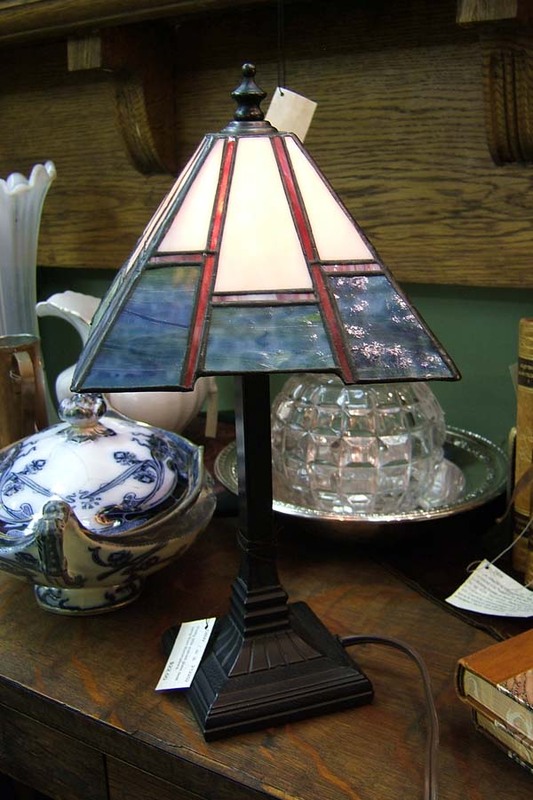 Sweet little "Illuminations" study lamp with a Frank Lloyd Wright appeal to its design. 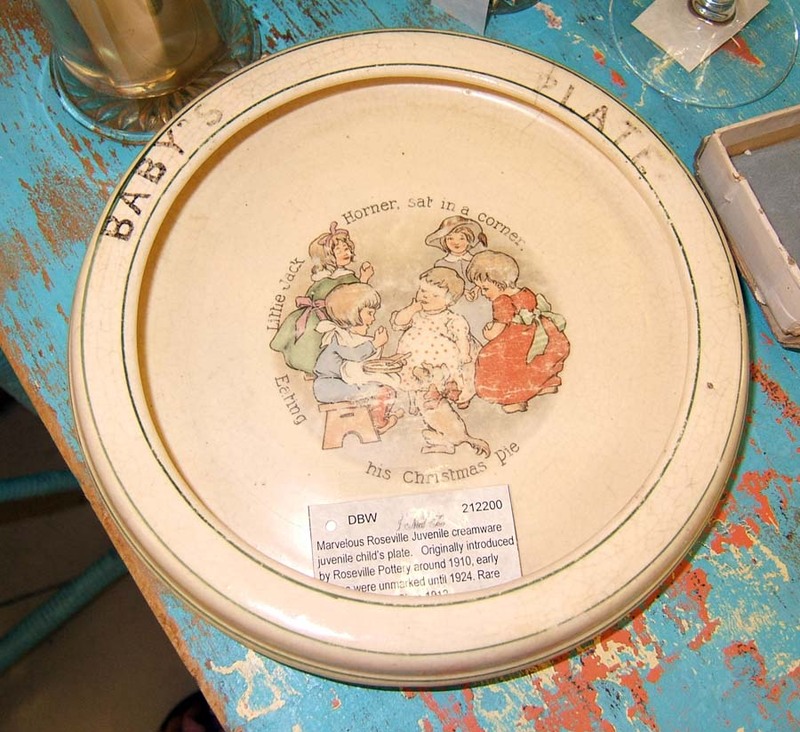 These baby/child plates always delight me and this 19"teens" piece by Roseville was a terrific find for a few dollars. 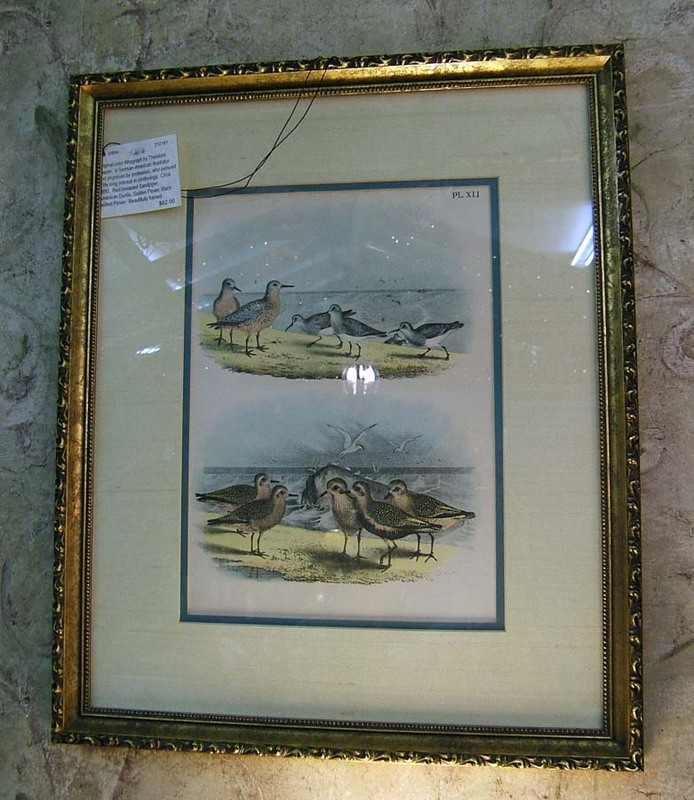 A lovely hand colored 1800s print of sandpipers beautifully matted with silk and in a gold leaf frame. I almost kept this for myself but sold the Poppies canvas which left an empty wall to fill in my booth. 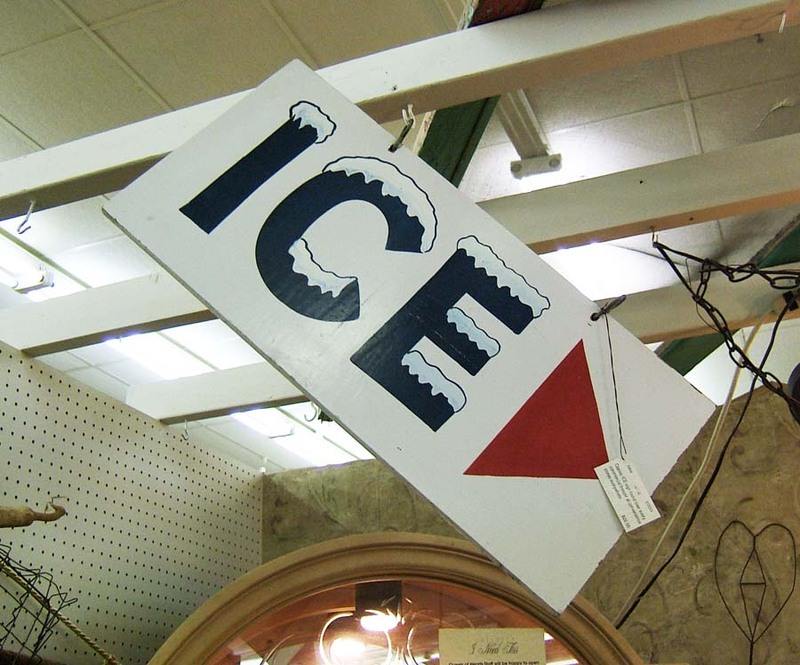 Everyone recognizes this sign that swings in front of every convenience mart that sells gas, snacks and ice, of course. This one is wood and handpainted on both sides. 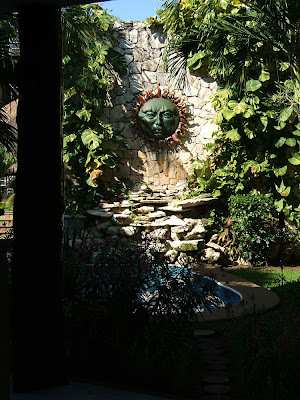 How cute would this be in a pool area or on your deck? Bobby pins from the 1950s and Marcel wave curlers from the 1920s. A surprise find. Pretty Lenox Elijah's cup for Seder. Original skew from the 1980s was still on it. 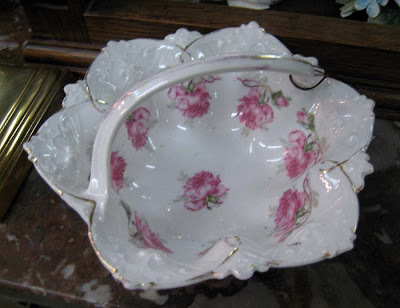 Paid $6.00 for it figuring I could easily price it at $18.00. Well, it always pays to do your homework, because I learned that this lovely piece was made and retired in the 1980s and is presently listed at $179.99 (when they can find it) on replacements.com. 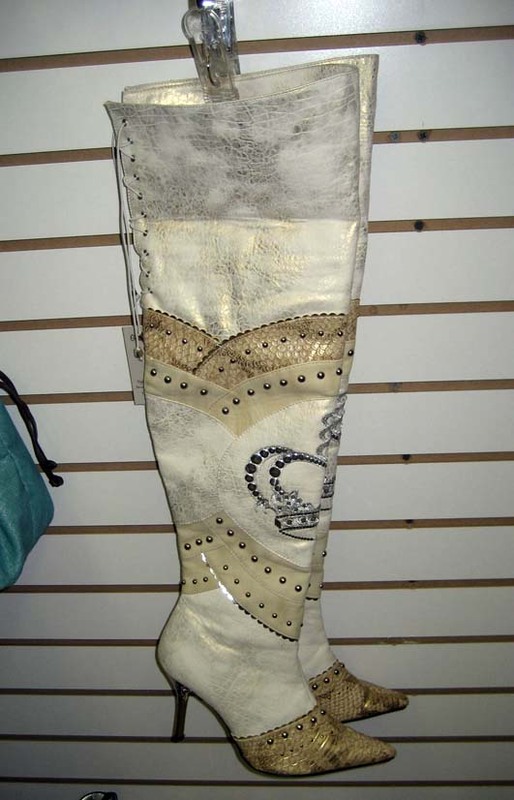 So my selling price moved from $18.00 to $85.00. 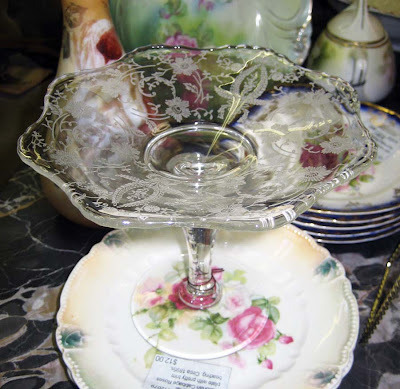 Still a great price for the Lenox collector. 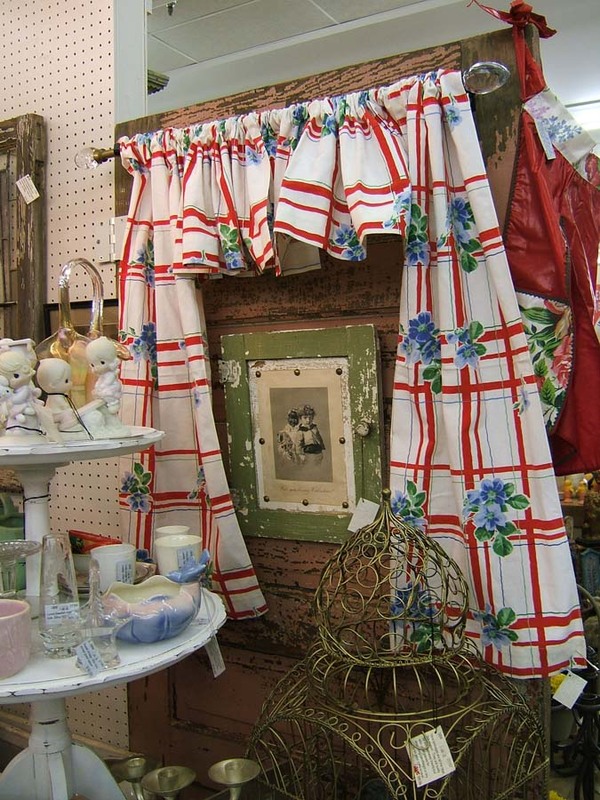 Set of terrific and crisp kitchen curtains from the 1950s. 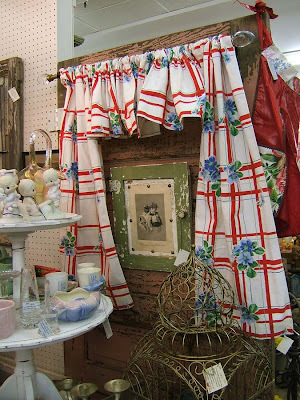 These are actually a set of cafe curtains, but I have them displayed as a single window with a valance. 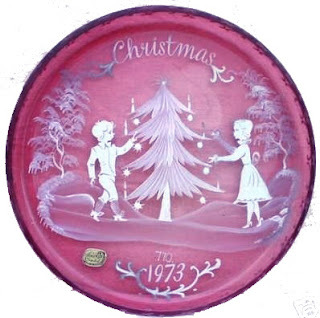 A pair of Mary Gregory Christmas plates. If I told you I paid $1.25 for each plate would you hate me forever? 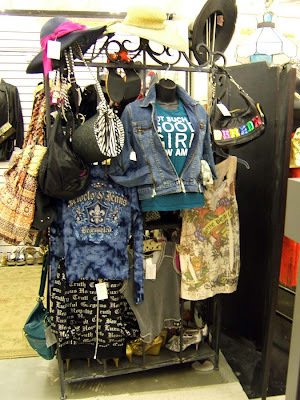 My vintage and designer label, "Girdle Gals" booth is taking off. 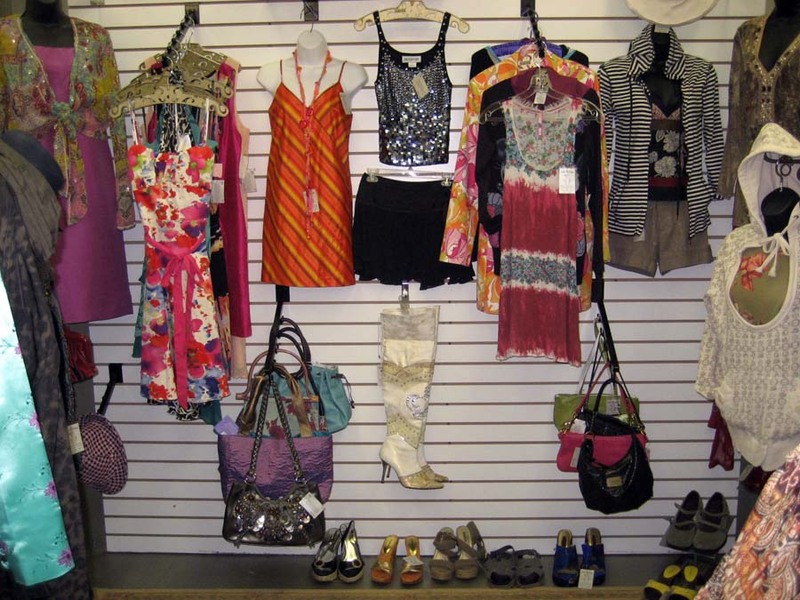 I'm so pleased as I just didn't know what to expect with this new venture. 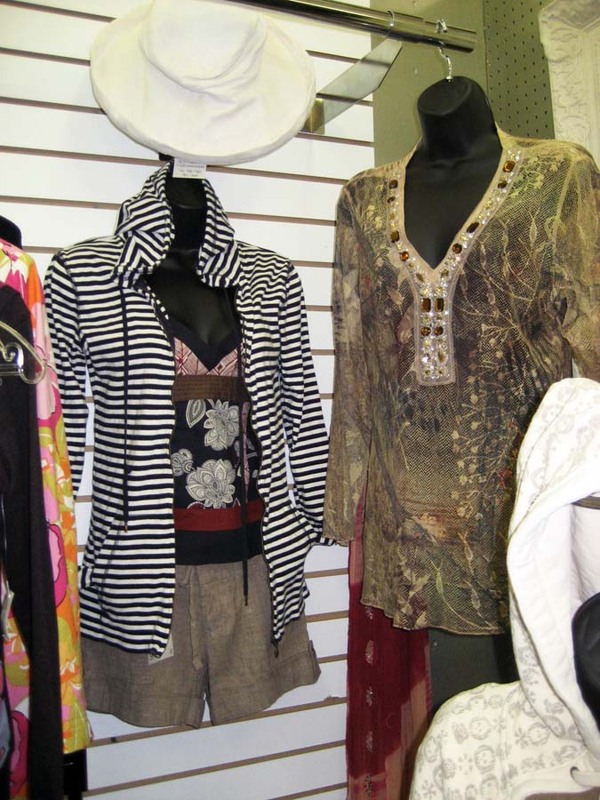 I change out the flat mannequins and bring in new items weekly so the inventory is always fresh for the customer. Moved the bakers rack so I could get use out of both sides. As I hung items on the back which actually faces the front of the booth, customers were buying things right out of my hands. I never enjoyed playing with dolls as a child, (more of a pup tent kinda gal) but I love display and putting things together so this has become my doll playing mode. The racks are full of colorful summer wear. Hello blogging friends. We have been back a week from our time in Mexico and I'm just now getting up to speed with work and blogging. It was a lovely vacation with 5 days at Sandos Playa Resort, an all inclusive 5 Star resort on the Mayan Riviera. 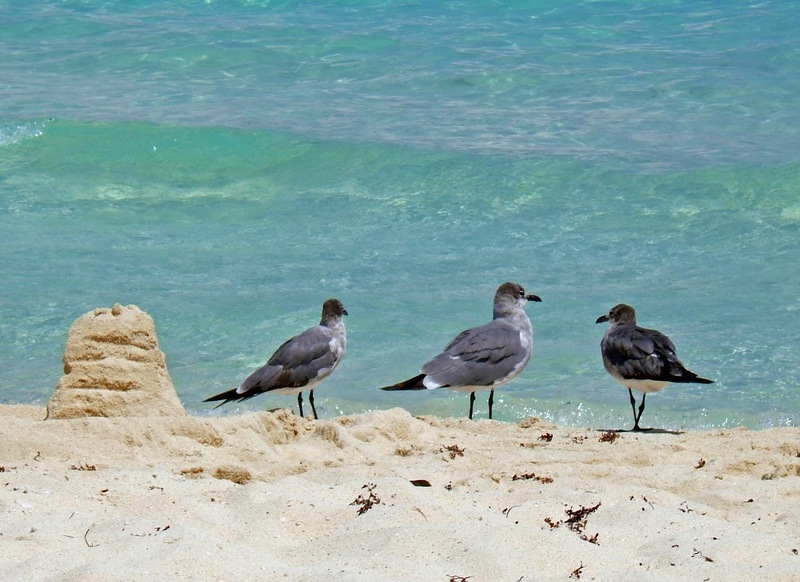 Beautiful white sands and gorgeous ocean waters. 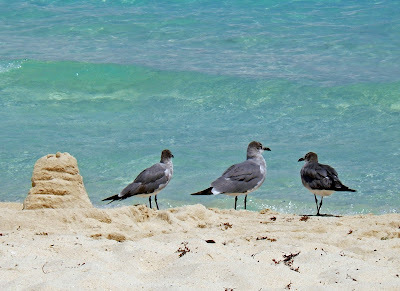 It was heaven and I spent most of the day reading mindless fiction on the beach and in the pool and the ocean. Heaven on earth to me. This iguana lived near the resort theater and greeted us every morning as we walked to the main pavilion. He was about 3 feet in length. I was walking towards the pool after a morning on the beach and I see everyone standing around the pool with their camera's and phones taking pictures. Seems a huge pelican dropped in for a swim. He swam for about 20 minutes and then hopped out of the pool and onto a lounge chair. He stood about 3 feet tall with a wing span of about 5 feet. 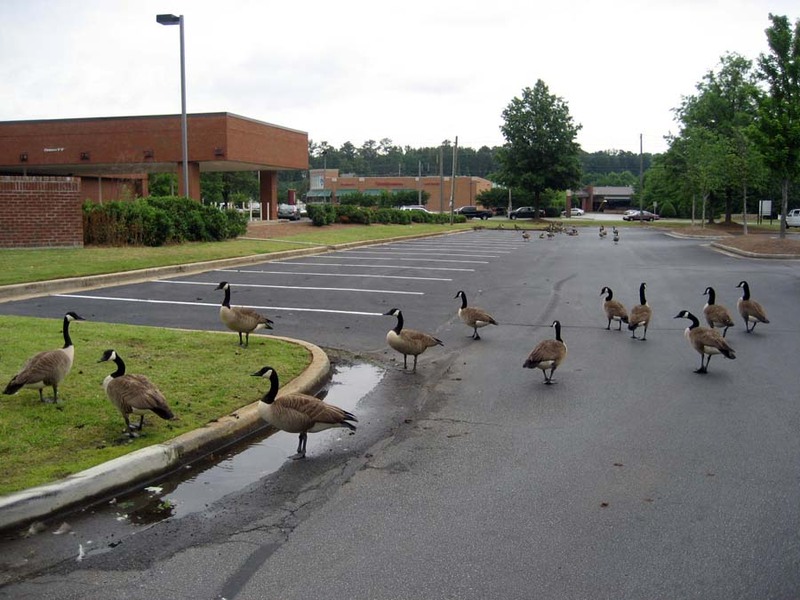 He was not afraid of people and when he finished preening his wings, he got bored with us and just flew off. 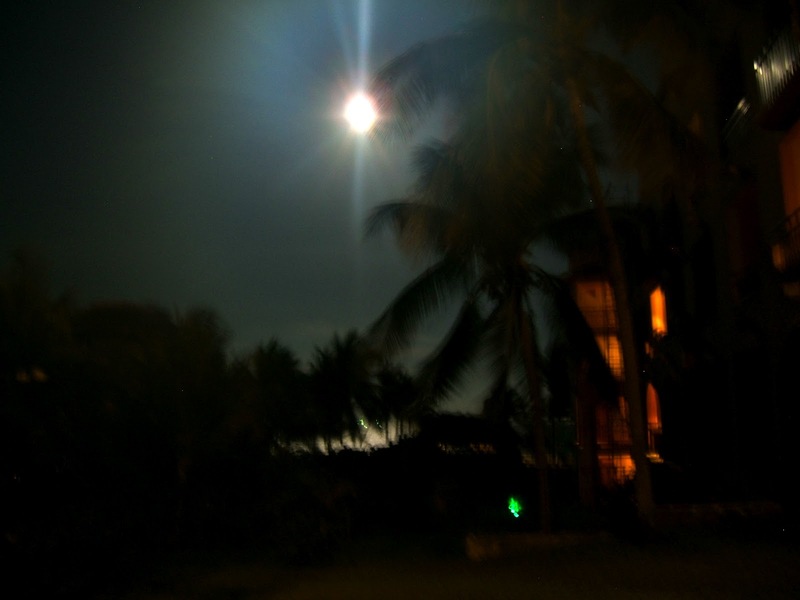 The super moon came out while we were there and I took this outside our patio around 10 pm. Okay, shameless plug. 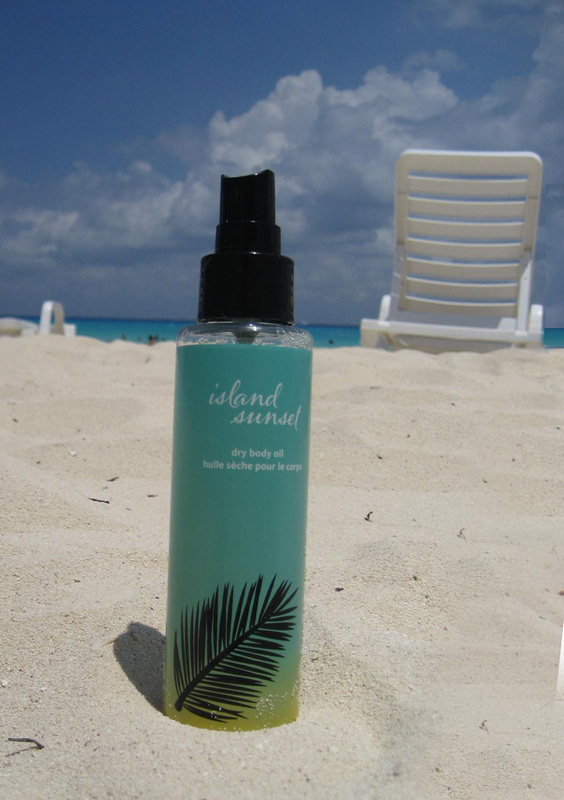 My friend sells Beauty Control products and they just came out with island Sunset Dry Body oil spray. I adore dry oil and its hard to find so when she showed me the product I had to have it. I use this on my hair when in the sun. Just a few spritz's and it protects your hair from the salt and minerals in the ocean and the chlorine in the pool. 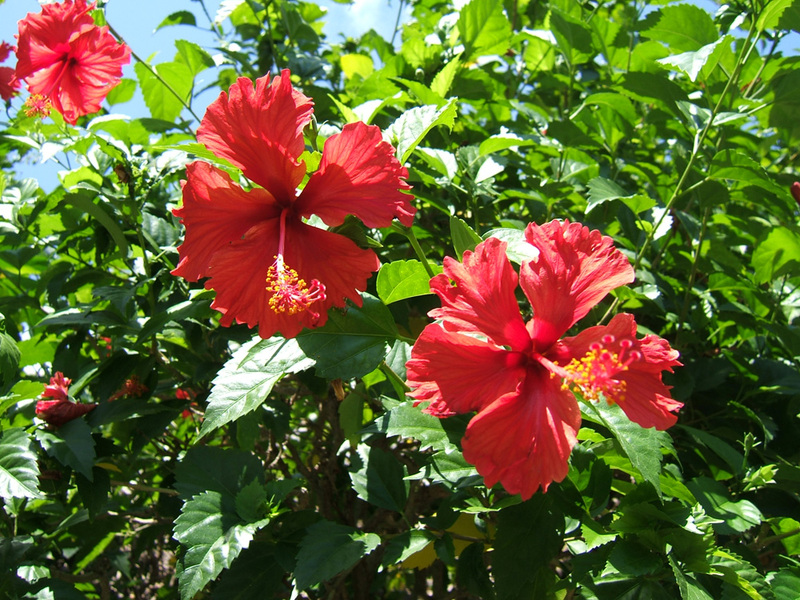 With the hot sun beating down on your hair it becomes a hot oil treatment as well. My hair following a shower was always smooth and healthy thanks to this marvelous product. I didn't realize how badly I needed this time to decompress until I finished my first book. 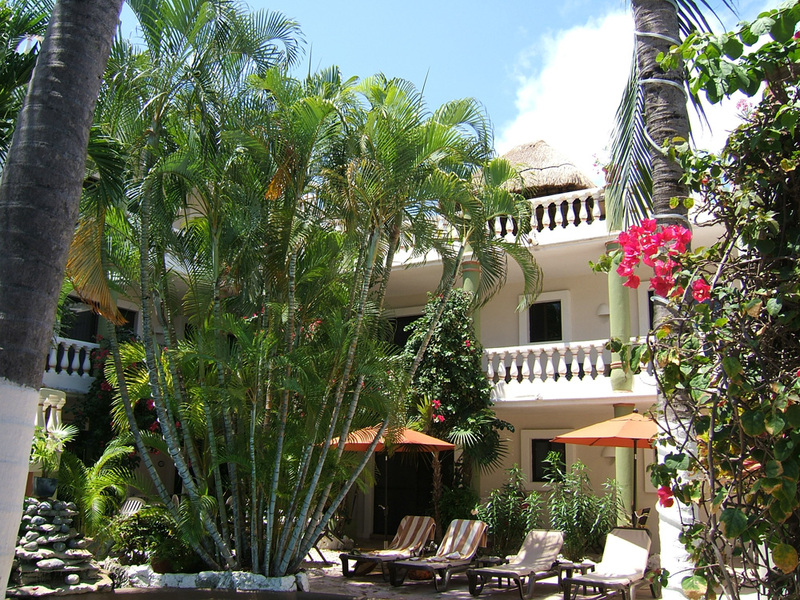 The first five days flew by and with two days left, my honey booked a two day stay at a "boutique hotel" in old Playa del Carmen called Adventura Mexicana. 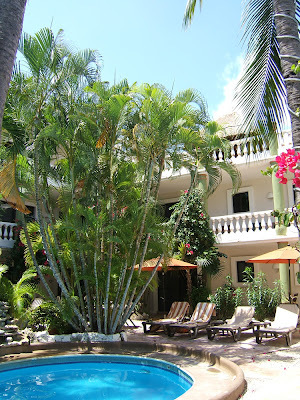 He had heard some good things about the boutique hotels in Mexico and so we extended our vacation by a few days at this best kept little secret. A short cab ride from Sandos to Adventura Mexicana and we walk through the open lobby off the street and this sculpture garden and pool greets us. 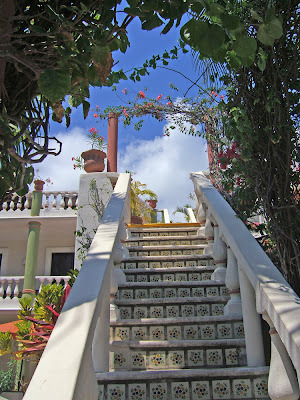 Everything about Adventura Mexicana is an intimate portrait of a hotel from the 1940s. Spanish colonial structures, hidden gardens, fountains, pools (yes pools), lounge areas and all in the center of the hotel property. 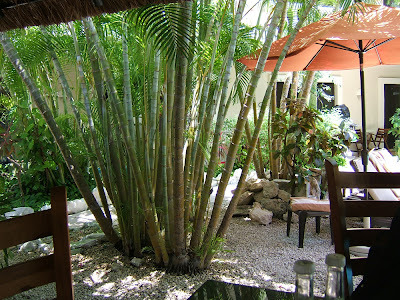 The little patio area off the main pool and just outside the Mayan Bistro, the restaurant on the property. 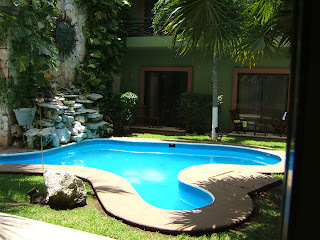 Lucky us, this pretty little pool was just outside our room. Be still my heart. 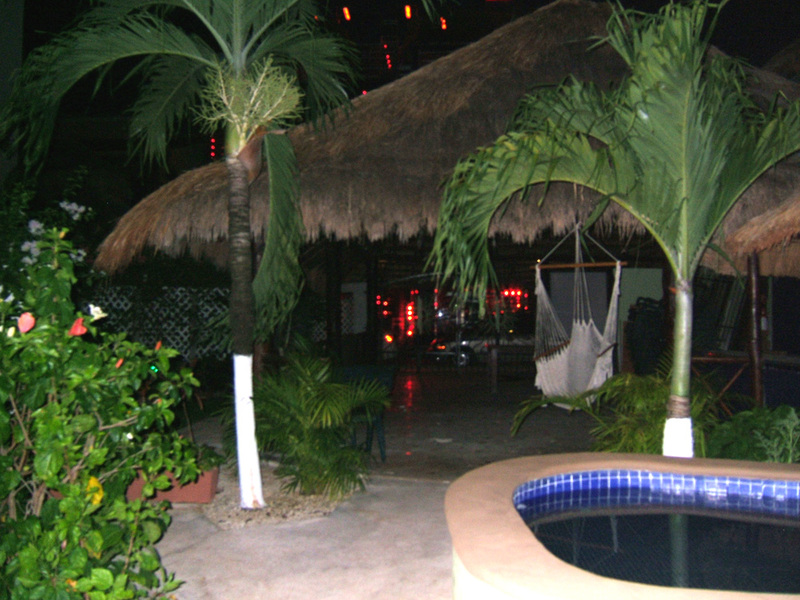 The main pool and lounge area. 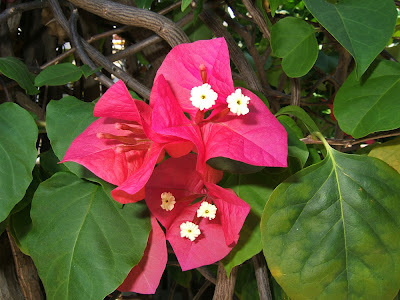 Such pretty little gardens everywhere. Smooth and alternative jazz played throughout. 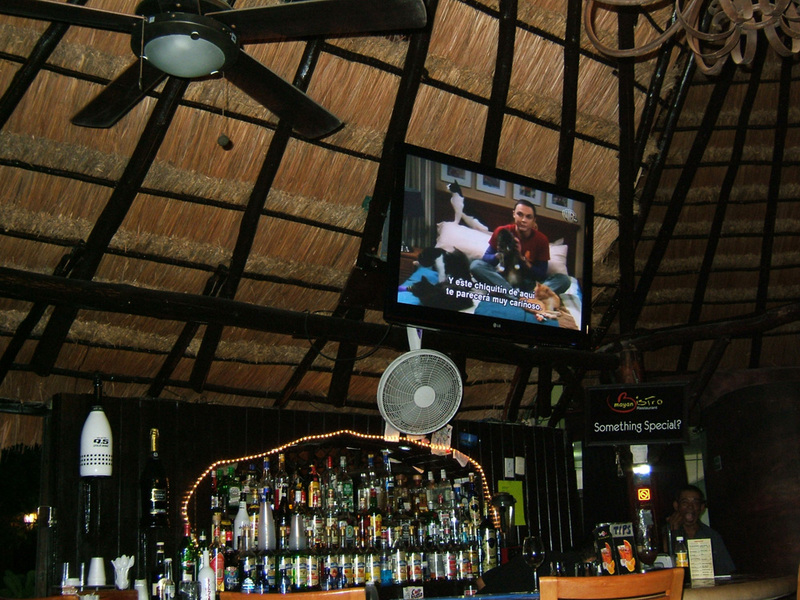 Great conversation with guests from all over the world, we would all gather around the bar, the patio and the pool. The stairs leading to the second and third levels were inlayed with beautiful Majolica tiles. Adventura Mexicana was filled with artisan sculptures, lighting fixtures and tiles. At the top of the stairway was a natural arbor. 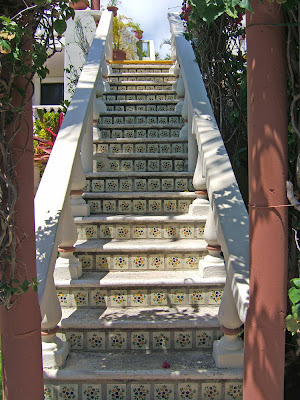 It is these details that made this property so lovely. Red Hibiscus surrounded the pools. 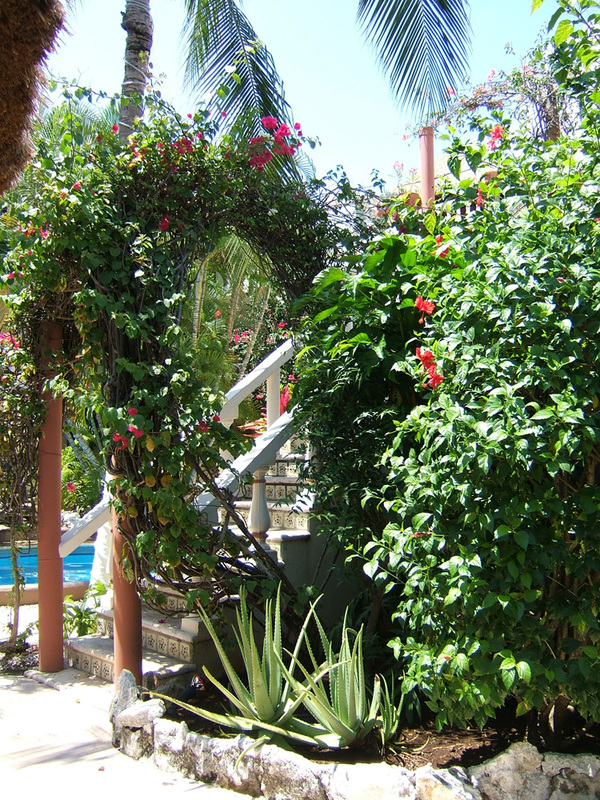 Another arbor of natural flowering shrubs. 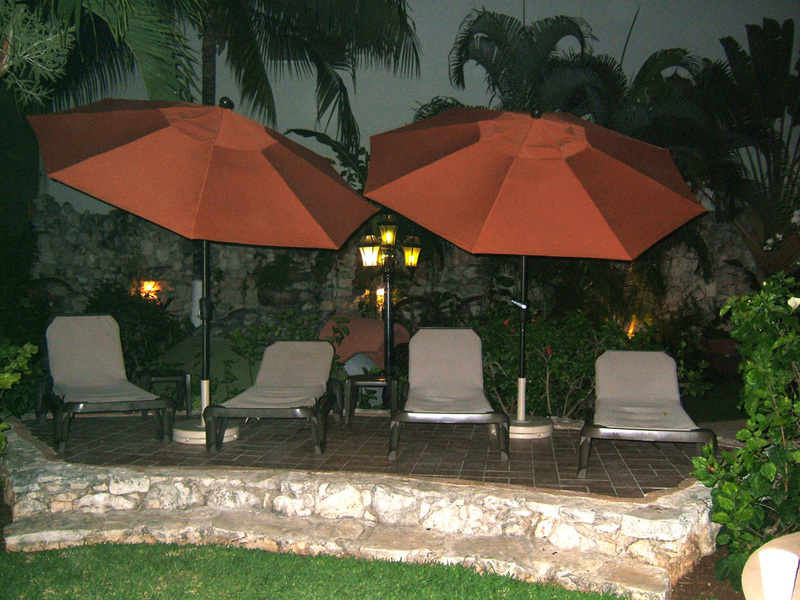 The view from the outdoor patio. 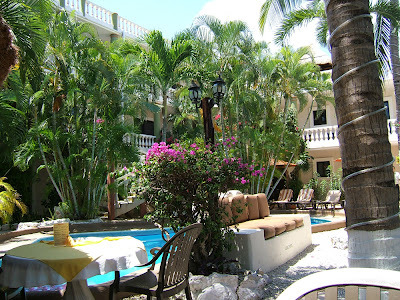 We would have lunch here and then return to the pool. The property has their own restaurant called the Mayan Bistro. 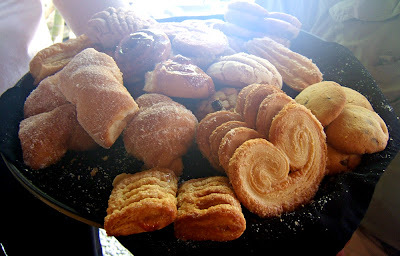 We decided to do the VIP inclusive for $32.00 a day which gave us unlimited drinks and food. 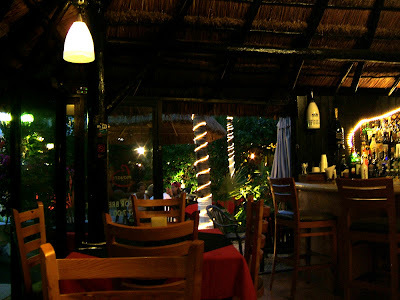 At night, we would eat in the restaurant and were never disappointed. The chef cooked everything to order and the portions were huge. 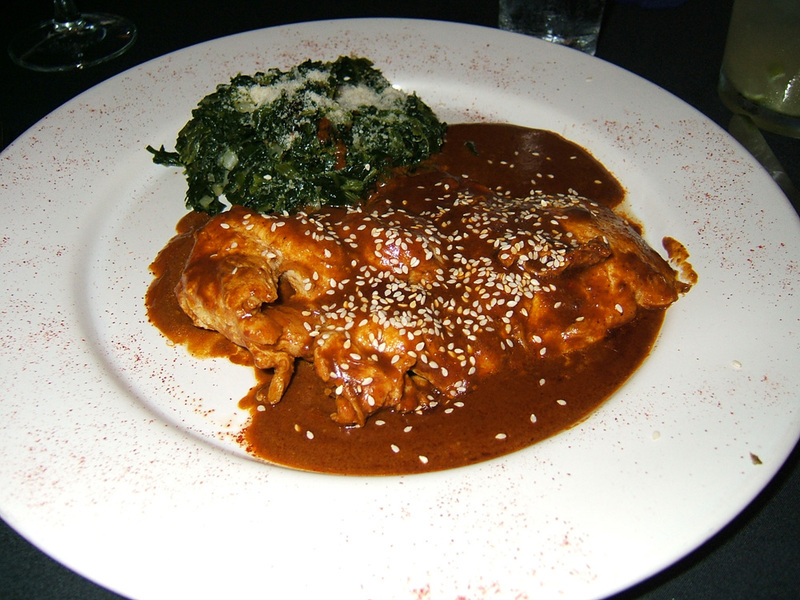 I had the Pollo Mole (chicken breasts with a chocolate and chili sauce) with fresh spinach. It was fantastic. 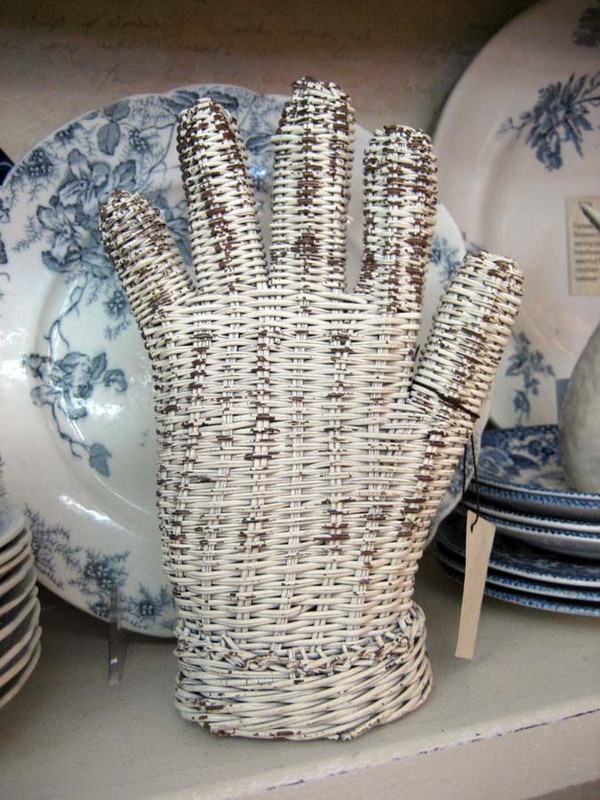 The wait staff would bring a basket of fresh rolls to your table at each meal. 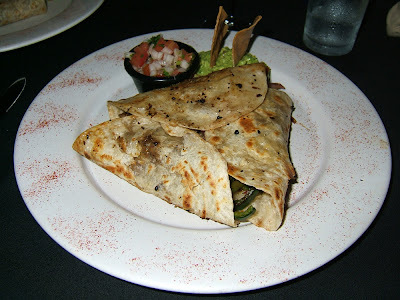 My last meal of our stay here was their steak burritos stuffed with fresh peppers, onions and all grilled to perfection. So good. El Gato came to visit my husband at every meal. At night, all of the trees were lit with tiny white lights, tiki torches and lanterns. The main pool at night. So inviting. One of the many little nooks you could spend time alone reading. 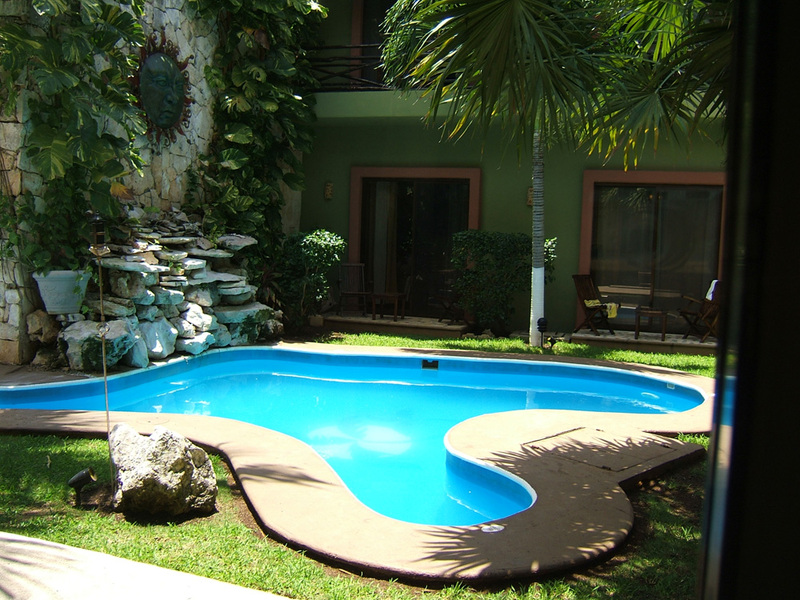 Use the hammock or sit in the jacuzzi. 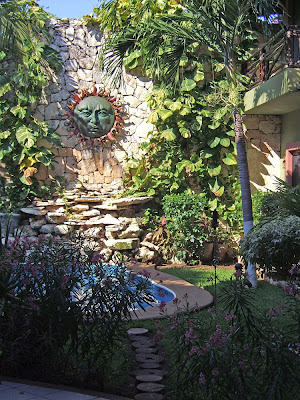 I moved as the sun did around the property and utilized different lounge areas so I always had the sun shining down upon me and a pool I could sit in and read. 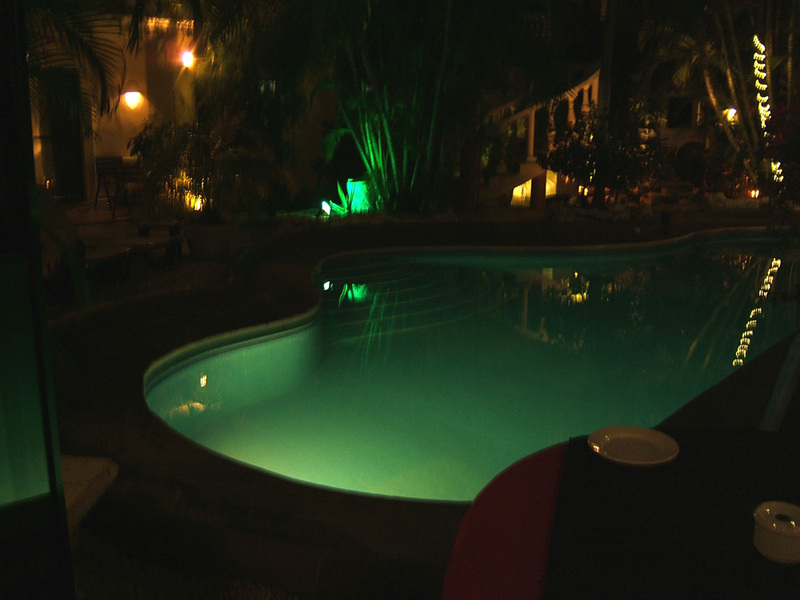 There is such a quiet intimacy to this lovely hotel. Extremely attentive staff with a welcoming smile and genuine love for hospitality. We felt more like family than guests and plan on returning again. 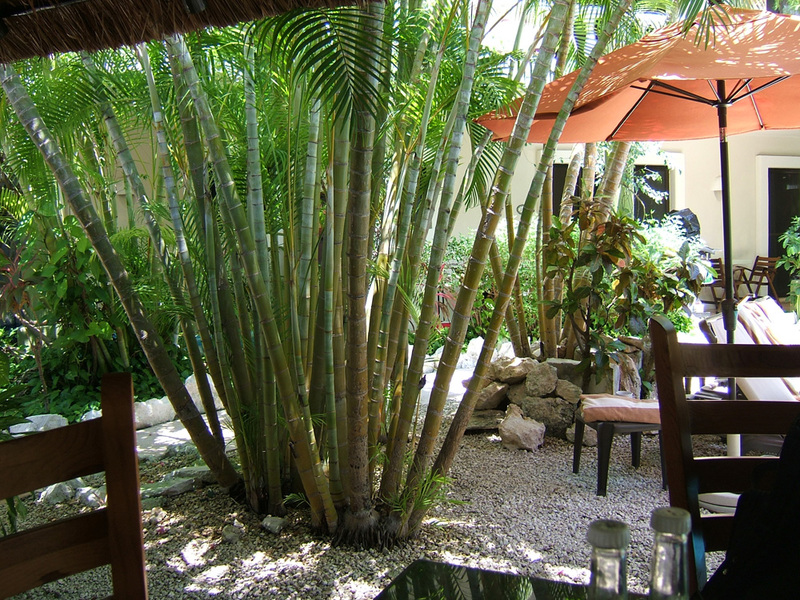 You could walk to the beach which was a block away right out the lobby entrance or through the Mayan Bistro you found yourself in the town of Playa Del Carmen. 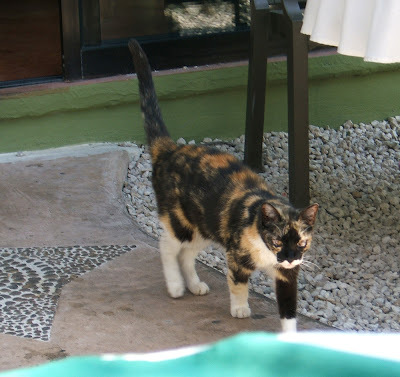 Safe and friendly, we walked around the block to use the Pharmacy, purchase tequila and do a little window shopping. The sun was just going down on out last day there and I will miss the friendly face that greeted us each morning and evening.